Also known as paw (with reference to the feet of dogs and cats). Consists of the epidermis and dermis. 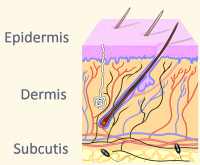 The layer of tissue directly underlying the dermis, but is not considered to constitute the true skin. It consists primarily of connective (collagenous and elastic) tissue and fatty (adipose) tissue. Cushion-like parts of animal feet. The tough, superficial cutis (outer layer of skin) of the pad is keratinized and hairless. Under the cutis is the thick subcutis. The fatty (adipose) tissue of the subcutis provides a cushion to absorb shock during locomotion. Pads are connected to bones by connective (collagenous) tissue. 1) carpal pads. Those of cats and dogs do not usually contact the ground. 2) metacarpal (or metatarsal) pads. Commonly known as heel pads. 3) digital pads. Commonly known as toe pads. 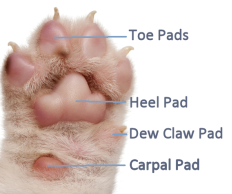 4) dew claw pads, usually on forelimb only.